The Right Rose Is Waiting for You | Valet. The sun's shining, we're all spending more time outside and it's about to get really hot. Which means rosé season is officially open. Sure, things got a little overhyped during the last few years, with dudes hashtagging their "brosé" and whatnot, but you know what? We ain't mad at the wine. And that's because a good rosé is downright delicious. On a hot day, you can find yourself gulping it down by the glass simply because it feels so damn good to drink. But you can actually sip it with dinner as well since it pairs nicely with pizzas, green salads and basically anything you throw on the grill. What we appreciate about rosé is that it's a wine that doesn't take itself too seriously. You want to drink it from a can at the beach or while catching a jazz concert in the park? There are some great Oregon and California wineries producing tasty wine in handsome cans these days. You want it out of a 40? You got it. A monthly delivery program so you're never low on bottles? Just sign up. What's more, you should drink these wines young, which means you can often find quality rosé from southern France (the birthplace of rosé) or Sonoma's coolest winery for surprisingly affordable prices. Most rosé comes in clear bottles and the wine's hue actually informs you about the flavor inside. To make rosé, the grape juice and skins are left to sit together for a short time (known as "maceration"). The longer it sits, the deeper the color. Clearer, subtle pink shades suggest a bright, crisp wine with a drier finish. While the richer, pinker shades will likely be denser, with fruity flavors and a touch of earthiness. Don't hesitate to break out the ice bucket. Most wines shouldn't be served ice cold, but with rosé, the chill helps maintain that signature acidic electric zing. Have you ever noticed how wine comes in different bottle shapes? What does the packaging reveal about the vino inside? 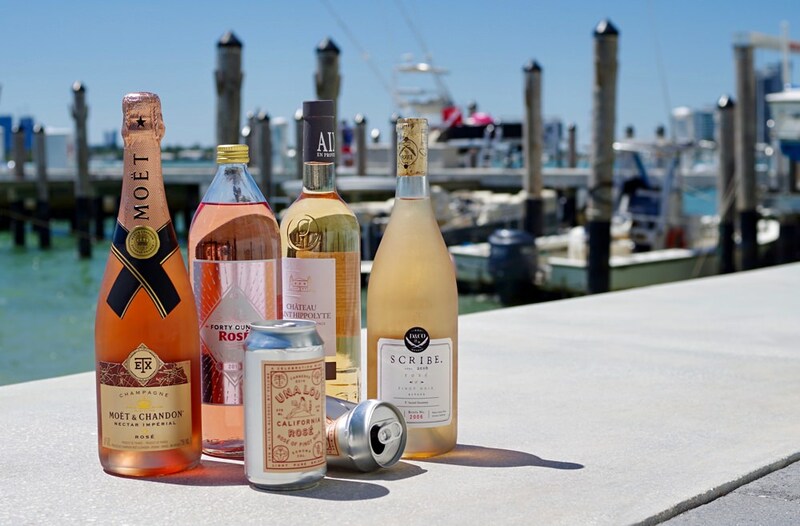 These inexpensive, portable wine cans were made for your summer adventures.